Unfortunately the "Free $10 to Spend on the ULTA Beauty Website" offer is no longer available. Here's your chance to score a full-size freebie! Shop the ULTA website to find cosmetics, makeup, fragrance, skincare, bath & body, and haircare tools from top brands like bareMinerals, Smashbox, and Murad. 2. Once logged in, click the "Get Offer" button and you'll be directed to ULTA to make your purchase. 3. Add any item or items that totals to $10.00 (excluding sales tax and shipping) to your cart and checkout. 4. 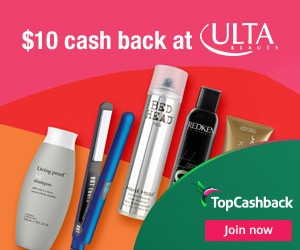 In about 14 days $10.00 will post in your TopCashback account. Offer valid through January 25, 2019.